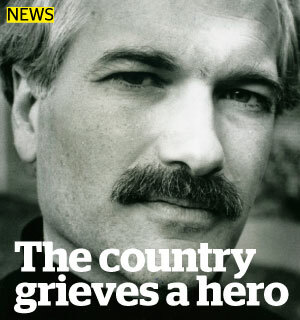 As the tributes to NDP leader Jack Layton roll in across the country, one is struck by the inchoate outpouring of grief. The secular liturgies of placing flowers and cards outside of the deceased’s place of work are unique for a politician. Can anybody point to any other politician for whom this tribute would eventuate? Layton somehow touched a cord inside people.Intuitively they understood that this was a politician with a difference, a man who genuinely cared. “A tribune of the people” as Rick Salutin called him. Layton’s last campaign,full of ebullience, hope and energy spoke directly to a jaded electorate.Waving his cane and fighting cancer Jack kept on keeping on. In a time of disillusionment, of market meltdowns, global warming alerts, mean spirited politicians, Jack Layton never lost hope in the human project the potential of public service to make life better for ordinary people. Torontonians knew this better than anybody.Here was a “blue blood”, his father a cabinet minister in the Mulroney government who took the next step away from the noblesse oblige attitude of Red Toryism to the social justice thrust of the NDP. Jack Layton was “whip smart”, a PHd prof with an extraordinary feel for the street, the average worker. He was on the right side of almost every issue. You name the issue Jack was there—from pioneering bike lanes, fighting for the homeless, welcoming boat people, championing the environment, helping AIDS victims.This was no show, He backed up what he spoke about. He wore out shoe letter listening to the homeless and the immigrant. We saw it first hand. Layton grew up in a progressive United Church home in Montreal.He understood the desires of Francophones. He also loved the progressive Catholic social justice tradition recruiting Chuck Angus and Andy Cash onto his team.In his fourth election he made a historic breakthrough and had he lived he would have overtaken Harper and become PM. Jack Layton’s unflagging energy, his fidelity to core principles of justice and equity, his inherent decency and civility—people are now realizing were rare qualities in a politician. They now sense that here was a public figure who actually cared deeply about the common good. Catholics have been late to understand Layton’s gospel orientation. It has taken a long time to crack the Liberal hegemony among Catholics but the last election saw breakthroughs in this regard.Vatican ll, Catholics who had internalized the gospel imperative of justice finally began to break ranks with the Liberal Party which in their addiction to power had forgotten their former social justice vision. Many abandoned Tories who had long ceased to be Red and had become rabid free marketers and insensitive to the plight of the disadvantaged. Still there are Catholics who live under the cloud of unknowing, so blinded by ideology divorced from values that they can not break from the script handed down to them by their parents and grandparents. They simply have not grown into a deeper analysis. None are so blind than those who will not see. Eastern Ontario would be a good place to start to understand the hermetically sealed cloud that envelopes good people.Jesus understood this when he warned people of his time that “a man’s enemies will be those of his own household”(Matt.10:36). In his time it was the overwhelming and distorted power of the clan, the family and the tribe. In traditional societies this prevented people from thinking critically. Traditional Tories, these eastern Ontario Catholics grew up among United Empire Loyalists and the ghost of Kingston lawyer John A Macdonald. Many have also voted Liberal but very few have countenanced the vision of the New Democratic Party and its gospel orientation of social justice. Even though the Party is now 50 years old,few Catholics in eastern Ontario can bring themselves to vote for the NDP.Jack Layton’s extraordinary political life may force the next generation to rethink. The present generation have not understood two salient facts.The Conservative Party is not the Conservative Party of their parents. It is a party of narrow vision whose policies have little time for working families, justice seekers or lovers of the environment.It is a party which will do nothing about abortion because it can’t. Yet many Catholics in rural areas are fooled into voting for a party which in many ways is the antithesis of gospel values. While it is true that no one political party can encapsulate the gospel, today’s Tories are the farthest from this incarnation. Jack Layton stood as a justice beacon for many Catholics. When so many bishops had forgotten that the cry of the victim was the cry of God, the leader of the NDP mercifully was present to keep the vision of the Galilean alive in the public realm. In this regard believers owe him a great debt. The obscene pics of fellow humans on the cusp of starvation in the Horn of Africa cries out for justice and deep questioning. It is difficult for any human being in possession of intelligence, faith or reason to logically explain this apocalyptic scenario. The world seems topsy turvy to many,driving well-meaning but confused people to an apolitcal, dehistoricized faith and politics. In times of oppression,if you don’t translate choices of faith into political choices, you run the danger of washing your hands, like Pilate said William Soane Coffin. There are too many hand washers voting for right wing parties who disengage from our seamless world where as Joe Louis once said to Billy Conn, You can run but you can’t hide.We are all one. Ultimately as in the UK,Greece and other places like North Africa, the victims will turn on you.It will not be a pretty sight. Roman Catholics watch as their benumbed leaders focus on World Youth Days, changes in the liturgy etc while we collectively are busy turning our home into an uninabitable place. Meanwhile famine stalks the land in Somalia as American hedge fund kleptos earn almost a billion each and the trolls who produced an economic meltdown not seen since the Depression all have their “get out of Jail” card in their pockets.Justice seems blind and non-existent. Privileged prats like UK PM David Cameron have to inerrupt their Tuscany holidays to come home and lay out a dumb “law and order” policy. No analysis at all. Finally is there anybody who truly believes that if these starving people were white we would allow this catastrophe to continue? MLK said it years ago: We can put a cruise missile within 50 feet of its target but we have not found a way to get food into the starving bellies of Africans. It is obvious that we need not a market correction but a spiritual correction in the direction of Jesus’ topsy turvy inversion of values he called the malkuth shammayim, the kingdom of God. Much verbiage and ink spilled over the riots in England and much worthwhile commentary in several places. There were some fine links to the Tory prat of a PM who assured Brits that the thugs who did the damage would feel the full brunt of the law.Fine, they should. All you need to know about PM Cameron was he had to return from Tuscany to address the issue.Last year he was hobnobbing on country estates with Murdoch and his minions. A British comic Nathaniel Tapley pointed this out in a hilarious letter to Cameron’s parents who obviously did not do a good job raising David.Cameron of course hectored the parents of the working class.Tapley’s point as you will read below is that Cameron and his privileged ilk live in another world from those abandoned in the inner cities of the UK, those who will never get to Tuscany. The riots did succeed in diverting attention to Cameron’s links with Murdoch and the gutter press. WIKLEAKs shows us the clandestine and hypocritical work of major players in the drama in Haiti. It pulls nack the curtain of nefarious anti-democratic, anti-poor activity of major players including the Vatican. Wikileaks documents now reveal conclusively the stunning coup against the popularly elected priest Jean-Bertrand Aristide. The US of course is the leader of this repulsive move against an overwhelmingly popular liberationist priest who put the poor at the head of the line. 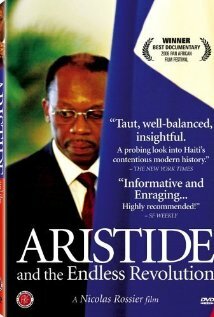 Aristide was exiled for over 7 years. The US can not bear another CUBA nearby, an economy with the poor as the central focus.This of course is a gospel imperative. Aristide did it by democratic means gaining an unprecedented 80% of the vote. Then of course his LAVALAS party was shut out and he was spirited out of the country by gunpoint. All with Paul Martin’s approval. WIKILEAKS show the extraiordinary lengths the US woould go to in their attempts to to thwart the clear will of the Haitian people. They were as desperate as GM was to pin spurious charges against Ralph Nader when he was having a salubrious effect on behalf of the common good in America. They could find nothing on Aristide because there was nothing. Here we have blatant hypocrisy and worse, twisted religion which have flourished in our neoliberal, dystopian world. Michael Coren the bloviating talking head,has almost topped his 2006 rant of Time to Bomb Iran with his staggering remarks about the fundamentalist Muslim hater Anders Brevik in Oslo. According to Coren the idealistic labour youth gunned down on Utoya Island had been critical of of Israel’s treatment of Palestinians.Shocking! Say it isn’t so somebody critical of modern Israel? How can this be?And so,according to Coren their murders were “ironic.” How so? How does Coren know this? Is he really playing the discredited “Holocaust card”, long used by Likudniks to stem any criticism of a state which consistently ranks at the bottom of least admired states in the world today for their abominable treatment of Palestinians. Coren recently left us another howler when promoting his latest love affair with the Roman Catholic church. Yes, our man assures us that “Eternal life is found in a relationship with the Roman Catholic church.” Those poor Protestants.Out in the cold again. I wonder about those kids gunned down in Oslo.They weren’t Catholics either. Royson James who helped create Ford with his incessant and unfair criticism of David Miller now recants. mantra has crept across the 49th parallel.The hysterical anti-statist stance which thinks you can have livable cities, not world-class but livable—compassionate and humane without taxes is not living in the real world. Justice Brandeis (USA) put it best: Taxes are the price we pay for civilization. Canada was blessed by having idiocy to the south. You want no taxes? Move to Mississippi and see what kind of a society you will find. like extending EI benefits for laid-off workers, investing in infrastructure, or supporting public programs through transfer payments (like health care or education).All of those programs create far more jobs than corporate tax cuts. How many ways can you say no? How about 169 — the number of deputants who overcame obstacles the mayor put in their way to speak out — in verse and rhyme and satire and a puppet show. Only one or two told the mayor to cut away to his heart’s content. Why are so many people opposed to the mayor’s direction, months after electing him? Where are the supposed majority who want Ford to take the axe to the bloated bureaucracy and too-rich services? Where is Ford Nation? Ford’s Flock? Where’s the average citizen, not belonging to any of those partisan groups, who just wants a healthy, affordable city?